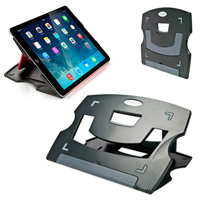 The Notebook/Tablet Riser from Aidata is designed specifically for use with lightweight notebook and tablet (9" -12") devices. With lightweight (0.9 lbs) high-impact plastic construction folding to just 0.5" thick it is ultra-portable. The 6 easily adjusted viewing angles (15°, 17°, 19°, 35°, 37°, & 39°) offer improved viewing and greater screen elevation which can assist in reducing neck bending. 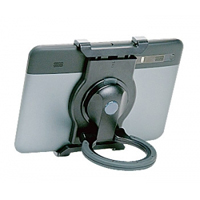 Rubberized grip pads on the base and the support ledge ensure that devices are held securely. 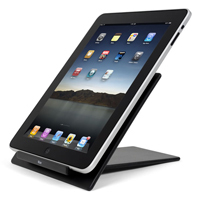 The iRizer Adjustable Stand from Matias is a portable stand for either a laptop or iPad. Adjustable to four height settings (20°, 30°, 40°, or 50°), this stand will elevate the screen of the device of the user so that it can be viewed more comfortably without increasing neck or back problems. Recommended for use with an external keyboard. Note: Two models are available in different sizes, one for a laptop, the other for an iPad. 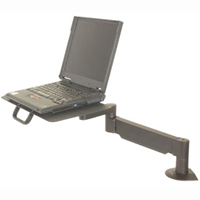 The Laptop Lift from Great Products Group provides 12 choices for custom fitting your laptop. At less that one inch thick (23 mm) you can take the Laptop Lift anywhere you go, whether at home or the office, in a hotel or on an airplane. 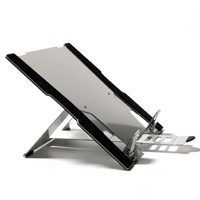 Made from high-grade plastics and stainless steel, the Laptop Lift gives you a rugged, durable and tough platform for your computing needs. The Goldtouch Go! Notebook and Tablet Stand supports mobile devices at a comfortable height and viewing angle, helping users reduce neck and shoulder strain. Made of high strength plastic polymer, the stand is light-weight and sturdy. 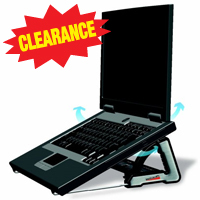 A non-slip shelf, measuring 5.75" by 1.5", provides a safe base for tablets and notebook computers weighing less than 6 lbs. 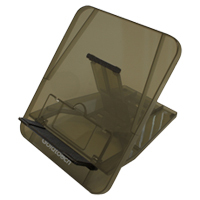 The stand folds flat for compact storage and portability. Le Goldtouch Go! Notebook and Tablet Stand soutien les appareils portable à une hauteur et angle de vue confortable, qui aide à réduire les douleurs dans le cou et les épaules. Construit en plastique de forte résistance de polymère, le support est léger et robuste. Une étagère non glissant mésurant 5.75 po par 1.5 po offre une base sécure pour les ordinateurs tablettes et les ordinateurs portable notebook qui pèsent moin de 6 livres. Il peut être plier complètement plat pour le rangement compact et pour le transport. The Flex Top from Bakker Elkhuizen is a lightweight, ultra-portable laptop stand that can be adjusted in seven different height settings (height range at back: 3.5" to 8.625"). Made of light aluminum (Hylite), the Flex Top truly integrates ergonomics into your notebook workstation by attaching to your notebook. This is just the product to help make your laptop user friendly. Simply place your notebook on the holding tray and the arm renders it weightless. One-touch adjustment will change height or position. 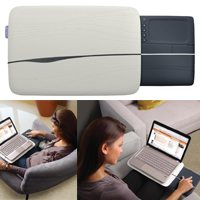 When you need space, the arm easily folds back to get the laptop out of the way until it is needed again. The Universal Tablet Stand from Aidata is a lightweight and portable stand for holding and displaying tablets 7" to 10" either in hand, on your desk, or by hanging. Made of durable hard plastic on the outside and soft rubber on the inside, it is easy to assemble and configure in landscape or portrait orientation. The ErgoTraveller is an ergonomic business laptop bag that provides quick access to a laptop while travelling - just open the case and go straight to work. 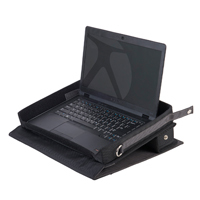 The ErgoTraveller raises the laptop to a slightly more appropriate height for viewing and prevents discomfort from the heat generated on the underside of the laptop. 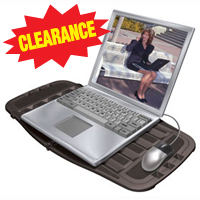 A portable laptop support for in the car, train or anywhere else that accommodates laptops up to 15.6".